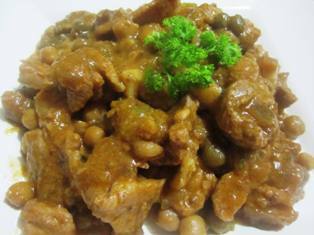 Afritadang Batangas is stewed thinly cut pork flavored like that of a Menudo. 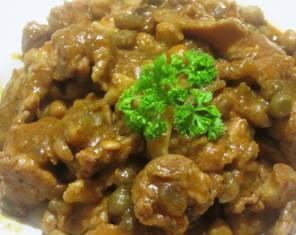 If you have attended a fiesta or any gatherings in Batangas, there would surely be an Afritada in the menu. I noticed that it is a staple dish not only in town Fiesta, but also in Weddings, Baptisms and Reunions, name an occasion, it surely will be served. This dish keeps me coming back to fiestas in Batangas. It tastes like menudo but the meat is cut thinly like in Filipino barbecue. 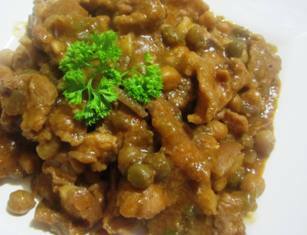 And it has a distinct taste that I believe only a Batangueño can prepare, especially if cooked in firewood. I asked why cook on the firewood when you can do it in a regular stove? Well, they say there's a certain flavor and aroma that the firewood imparts to the dish. 1. Pan fry the meat in oil until slightly browned, then remove from oil and set aside. 2. Saute the garlic and onion in the same pan. 3. Put the meat back in the pan and add soy sauce, then tomato paste. Stir and cook for a couple minutes. 4 . Add some water, and let it cook until the liquid is reduced to half and the meat is tender. 5. Mix in the pickle relish, green peas and garbanzos. 6. Add the tomato catsup and thicken the sauce with bread crumbs.